Aerial view of Wallops Island launch site that includes artist concept of Antares rocket on pad. The maiden launch of a new private rocket that eventually aims to loft cargo toward the International Space Station is slated for the middle of April. 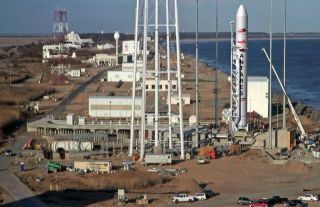 The Antares rocket, which is being developed by aerospace firm Orbital Sciences Corp., will blast off for the first time April 16-18 from NASA's Wallops Flight Facility in Virginia, NASA officials said. Antares will launch a simulated payload to a target altitude of 155 miles to 185 miles (250 to 300 kilometers). If all goes well with the test flight, which Orbital is calling A-One, the next step will be a demonstration mission to the space station using Antares and the company's robotic Cygnus capsule, company officials said. That test run to the orbiting lab should take place later this year, Orbital has said. Virginia-based Orbital Sciences holds a $1.9 billion NASA contract to make eight unmanned supply runs to the station with Antares and Cygnus. The space agency has also signed a $1.6 billion cargo deal with SpaceX for 12 flights with its Falcon 9 rocket and Dragon capsule. SpaceX completed the first of these bona fide supply runs last October, and Dragon is docked to the station now on contracted mission number two. The capsule is slated to return to Earth on March 25 with about 2,670 pounds (1,210 kilograms) of scientific experiments and other gear. The deals with Orbital and California-based SpaceX are part of NASA's effort to encourage American private spaceflight firms to fill the void left by the retirement of the agency's space shuttle fleet in 2011. While commercial cargo deliveries are already underway, NASA also wants private spaceships to start carrying its astronauts to and from the orbiting lab by 2017. Until that happens, the agency will be dependent on Russian Soyuz spacecraft to provide this taxi service, at about $60 million per seat. Cygnus is a cargo-only vehicle, but SpaceX is working on a manned version of Dragon. Other major contenders for a NASA crew contract are Boeing and Sierra Nevada Corp., which are developing a capsule called the CST-100 and a space plane called Dream Chaser, respectively.